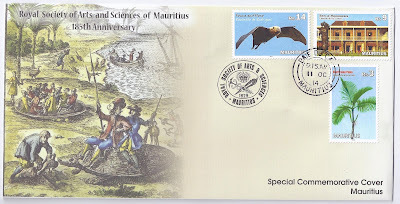 The Royal Society of Arts and Sciences of Mauritius in collaboration with the Mauritius Post released two Special Commemorative Covers (SCC) on 24 August 2004 and 11 October 2014 to mark their 175th and 180th anniversaries respectively. 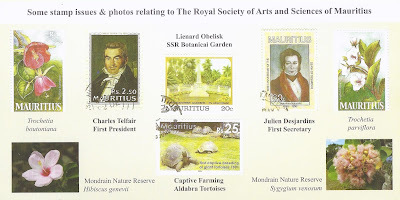 In August 1829, Charles Telfair and Julien Desjardins (their portraits are represented on the 175th anniversary SCC) founded the 'Société d'Histoire Naturelle' (Natural History Society), later the "Arts and Sciences Society of Mauritius" which was to become a forum where all inhabitants of Mauritius interested in arts and sciences could express themselves. It was the first learned society to be formed in this part of the world and soon attracted the intelligentsia from the island. 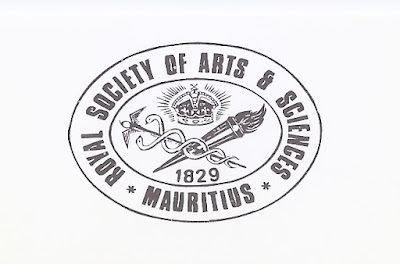 In 1847, Queen Victoria gave her assent to add the word "Royal" to the name of the society in recognition for its work known since then as "The Royal Society of Arts and Sciences of Mauritius". Thus, many of the prestigious scientific men and lovers of arts in this country have honoured the Society by joining as members, and have contributed to its advancement and to that of the country. The list of these benefactors is inscribed on the Liénard obelisk at Pamplemousses Garden, to acknowledge their contribution to the advancement of sciences, arts and the conservation of our environmental heritage. During the 19th century, the Society played an important role in the development of the country. It was instrumental in the creation of the Mauritius Chamber of Agriculture, the Agronomic Research Station, the Herbaeum and the Mauritius Institute. Its participation in international exhibitions has also contributed to the fame of Mauritian sugars. National exhibitions were also organised to promote arts, agriculture and innovations. The tenacity of the members has helped to convince the nation of the importance of ecological preservation of our island. For instance, as early as the 19th century, the Society persuaded the international scientific community to back its efforts to induce the Mauritian government to start the captive farming of the Aldabra Giant Tortoise (Aldabrachelys gigantea) in Mauritius and the Seychelles (the Seychelles were still administered by Mauritius at that time) to preserve it from extinction. The society was also active in the first efforts to preserve the fauna and flora of Round Island. In the 20th century, with the help of the Mauritius Sugar Industry Research Institute (MSIRI), it was able to establish the Mondrain, the first private nature reserve of the country and undertake an ecological restoration programme recognised worldwide. All the work of the Society's members have been published, since 1829 in Transactions, and now in the Proceedings which present a wide range of scientific and artistic articles of utmost importance for our country. The Society inherited 20,000 manuscripts which the late Leon Doyen was hoping to use for his History of Mauritius. A soft copy of those documents has been published recently, on sale at Rs300. The archives of the Society contain paintings, correspondence, some books and scientific reports, a number of which dating since the end of the 18th century. For conservation purposes, they are kept at the Blue Penny Museum. 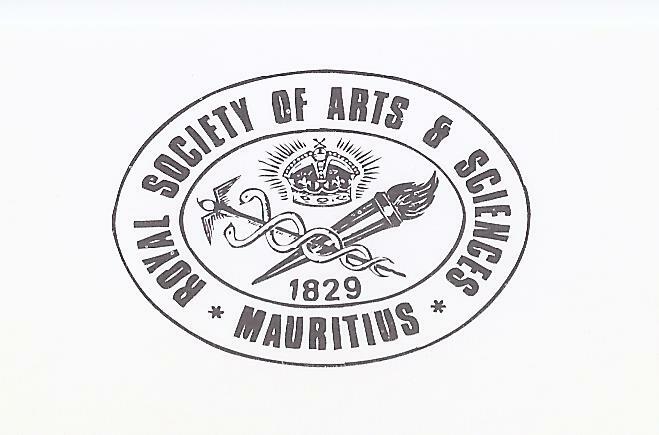 The Society was first housed at the Royal College, Port Louis, then as from the 1880's at the Mauritius Institute, still in Port Louis. In 1958, it moved to the MSIRI, Réduit which is today under the aegis of the Mauritius Cane Industry Authority. Over time, the objectives of the Society have remained the same, and if the members through the generations have changed, the enthusiasm for the preservation of our ecology and appreciation of art is just as great. Regular conferences and outings to raise awareness on conservation and art are regularly organised. N.B. : The above text is adapted from the 180th anniversary SCC insert. Re1 - Trochetia boutoniana (Boucle d'Oreille), the national flower of Mauritius since 1992. This SCC was hand stamped at Moka Post Office. From the 'Site & Monuments' issue of 18 April 2013. From the 'Fauna & Flora' issue of 28 March 2014. From the 'Fauna & Flora' issue of 30 August 2013. The coloured lithograph on the SCC comes from 'La Description de l'Univers' (The Description of the Universe) by Allain Manesson and published in 1683. 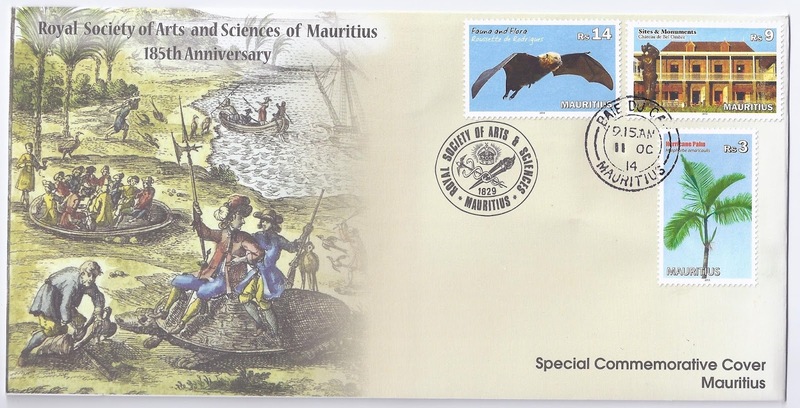 It represents the first activities on Mauritius by the Dutch in 1598 and the native flora and fauna on the island at the time. 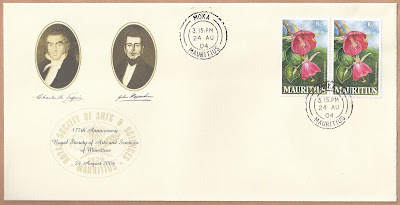 This SCC was hand stamped at Baie du Cap Post Office and officially launched on 11 October during a reception held at the Place du Moulin in the Bel Ombre mansion. The guest star was Dr. Julian Hume from the National Museum, London. Dr. Hume participated in the excavations works in Mare aux Songes to find remains of the Dodo (Raphus cucullatus). 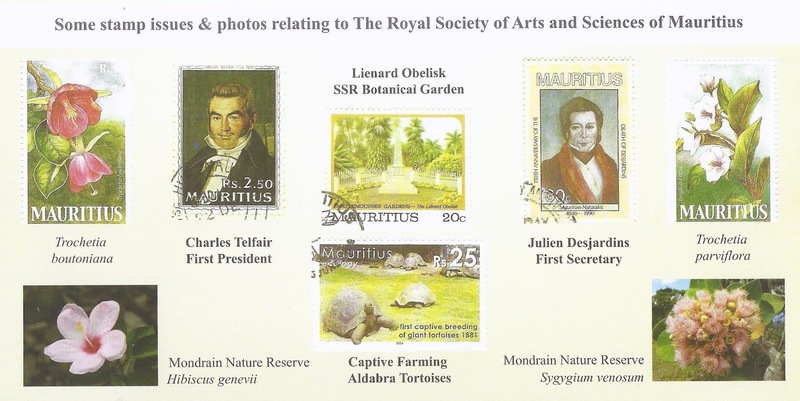 Some of his paintings were also reproduced on the 'Extinct Mauritian Giant Tortoises' issue of 16 July 2009 (four stamps and one miniature sheet).